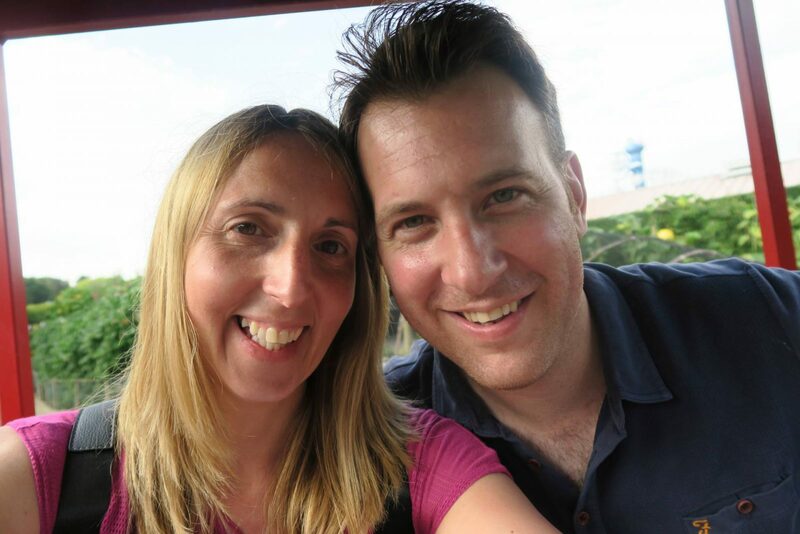 We were recently invited to spend a couple of days in Hampshire by Hampshire’s Top Attractions. After a lovely day at Sir Harold Hillier Gardens and a good nights sleep at The Potters Heron Hotel we were ready for our trip to Paultons Park. 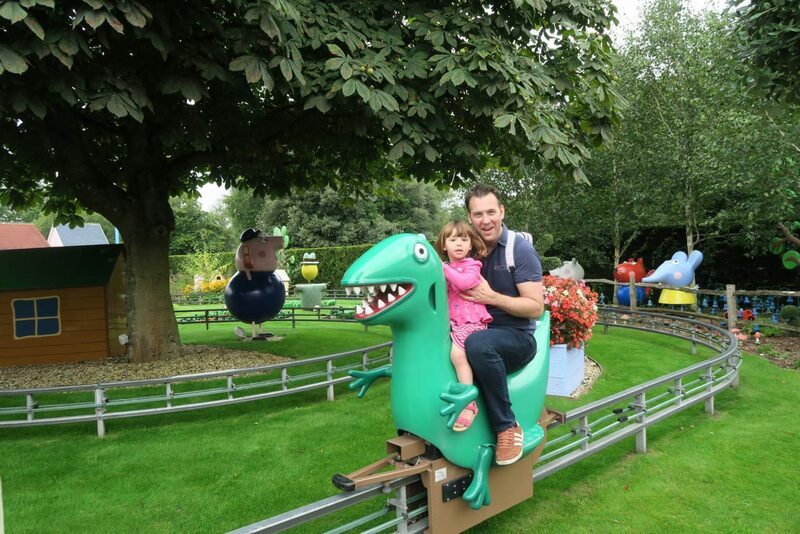 With our little Holly being Peppa Pig mad, no trip to Hampshire would be complete without a visit. It was also Holly’s third birthday a couple of days later, so this was a real birthday treat for her. 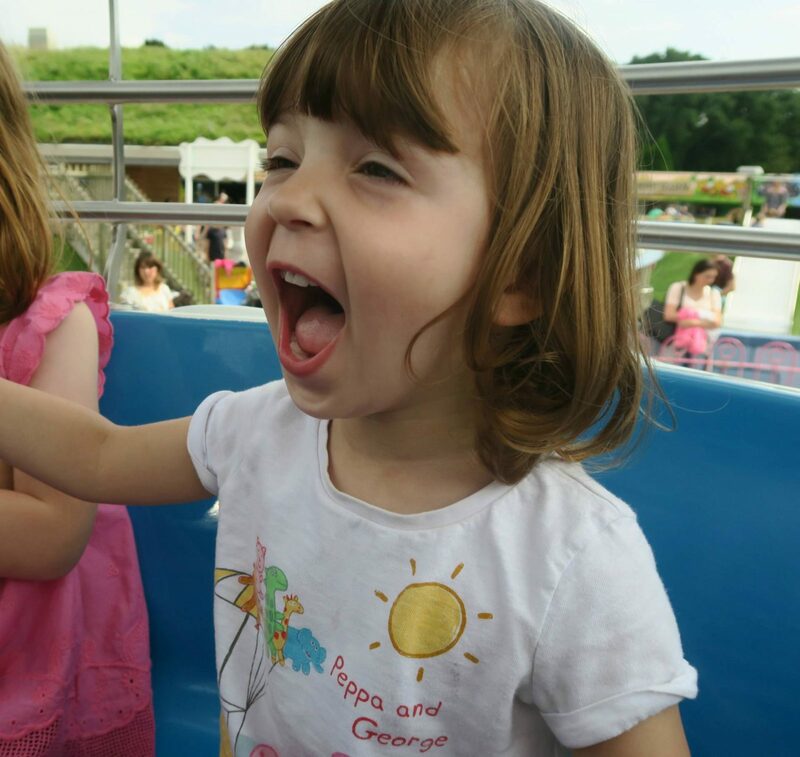 Alice is at an age where she is happy to watch Peppa Pig with Holly and she definitely still loves Peppa Pig World. 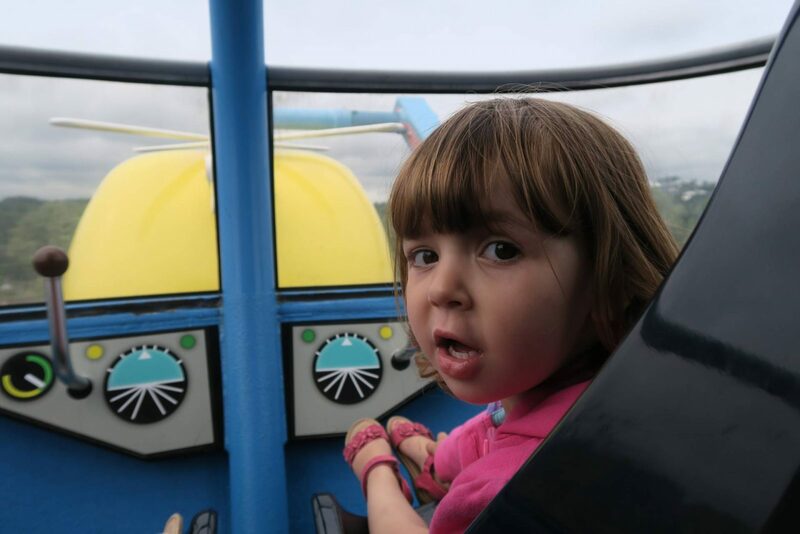 But I was keen to explore other parts of Paultons Park to see what rides they had that she would like. 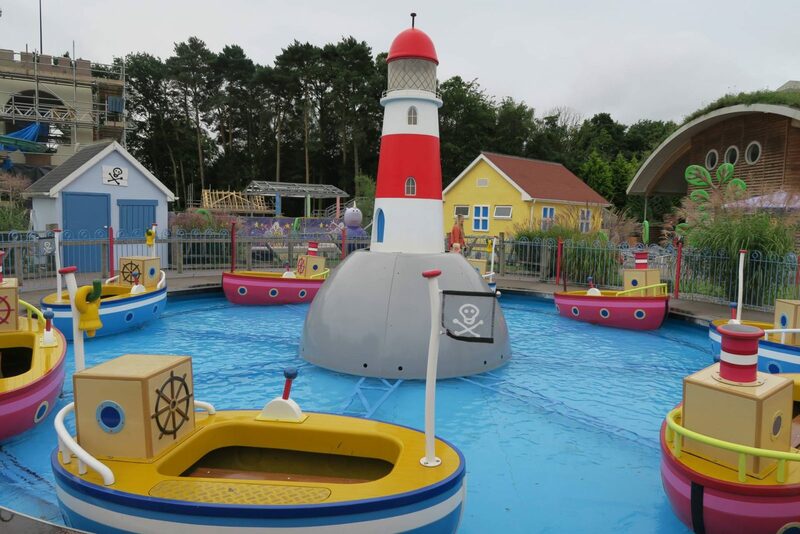 My top tip for anyone visiting Paultons Park is to get to the till point for 9.30am, as this is when you can enter. 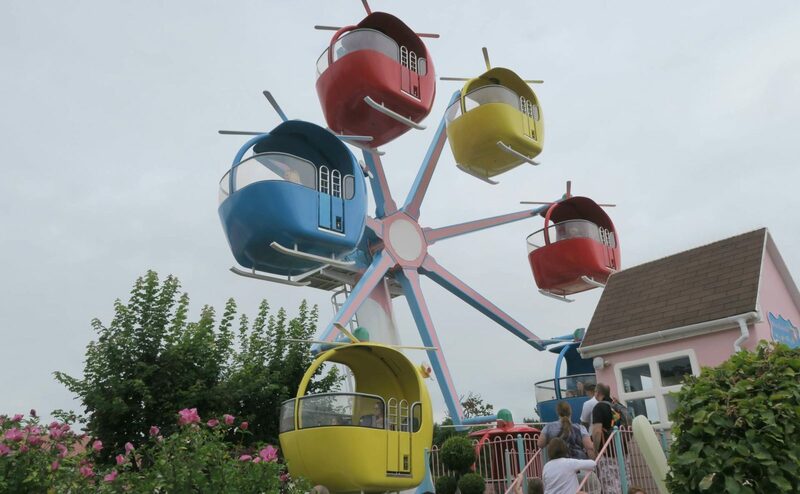 You then make your way through the park to other gates which will open at 10am, which is officially when Paultons Park opens. By deciding which ride you want to go on first you can go to the gates that are closest. 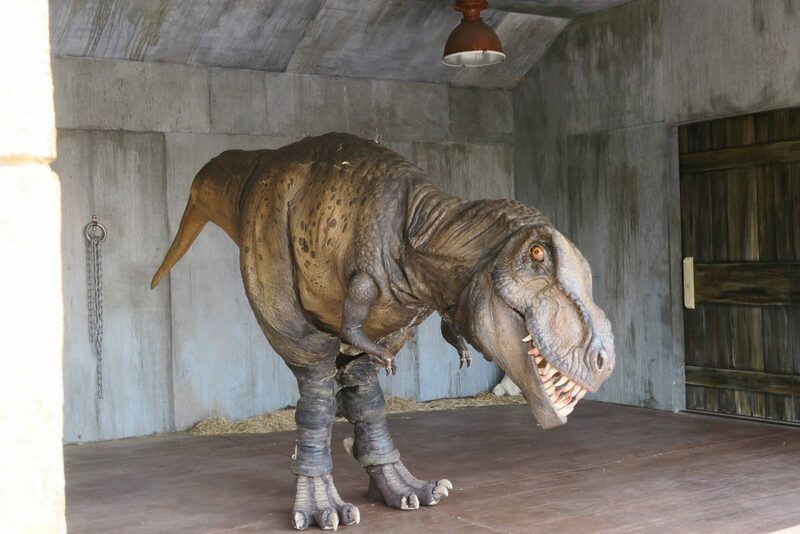 We knew that George’s Dinosaur ride in Peppa Pig World has long queues and this was the one we rushed over to once the gates opened. We were the second people in the queue, result! 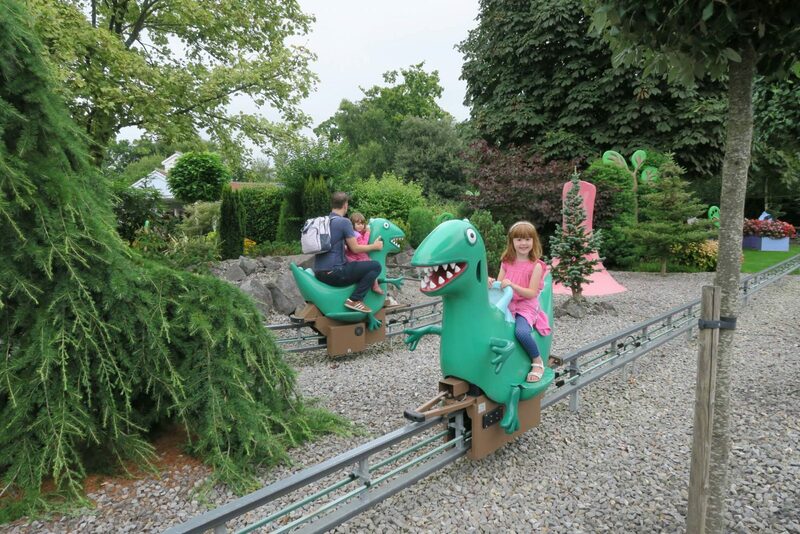 Andy and Holly hopped on a dinosaur and then when it was Alice and my turn, we were told Alice was tall enough to ride on her own. She was so excited! I left the queue and ran round to watch them. We then managed to quickly get onto Daddy Pigs car ride. The girls loved being able to drive and us being in the back. Holly’s face just lit up and she was in Peppa Pig heaven! By the time we got off daddy pigs car, the queues were now at average length. Which thankfully wasn’t too long. Holly spotted Peppa Pigs House and ran off to look inside. It was then onto Grandpa Pig’s Train and as soon as we hopped off straight onto Grandpa Pig’s Boat. We had time for one more ride before lunch and the girls choose Miss Rabbits Helicopter. This is another ride which always has a long queue and today was no different. We queued for 30 minutes, but it went quickly and the girls didn’t mind. Plus it’s worth the wait, this is one of the girls favourite rides. Probably because they get to wear a seatbelt and drive the helicopter. For lunch we headed to the Daddy Pig’s Big Tummy Cafe that was situated in Peppa Pig World. They did lunch bags for the girls which were great value and no more than I pay in high street cafes and garden centres. If we hadn’t been staying in a hotel the night before I would have brought a picnic, as there is plenty of picnic benches and grass to sit on. With lunch over the girls were desperate to play in George’s Spaceship indoor soft play. It’s worth noting they are very strict about wearing socks. I had brought some with us, but if you forget they sell socks in Peppa’s toy shop next door. 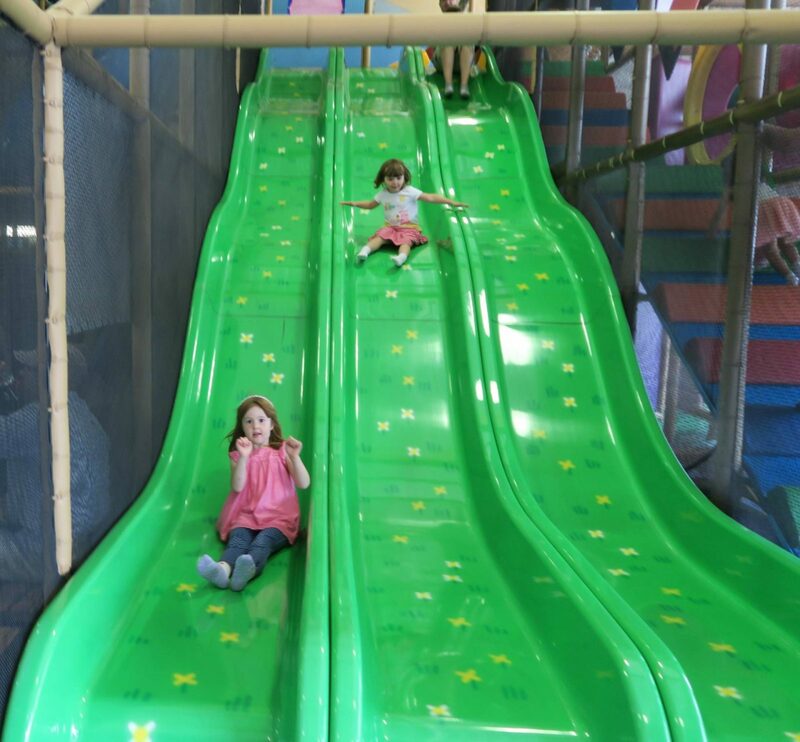 Both girls were able to make their way around the soft play on their own and had lots of fun. Alice climbed to the top and sat in the hot air balloon. Whilst Holly just wanted to go on the slide again and again. There is an area for younger children too. It was then time for Holly’s nap and while Andy took her off for a sleep. 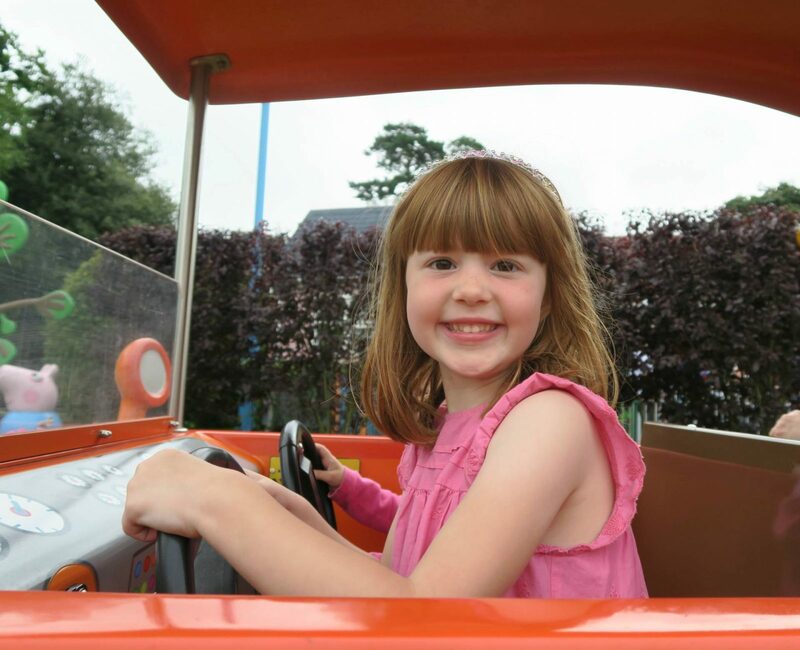 Alice and I headed over to Paultons Park for her to go in the splash park. Yes, if it’s a sunny day bring your swimwear. Alice loved splashing about and as it was lunchtime it was fairly quiet too. 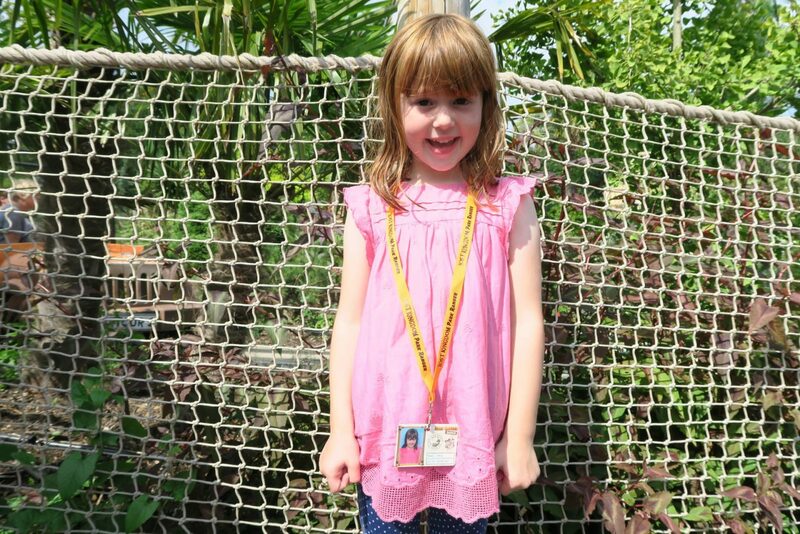 Afterwards we went to The Lost Kingdom, as Alice was keen to get her rangers licence. 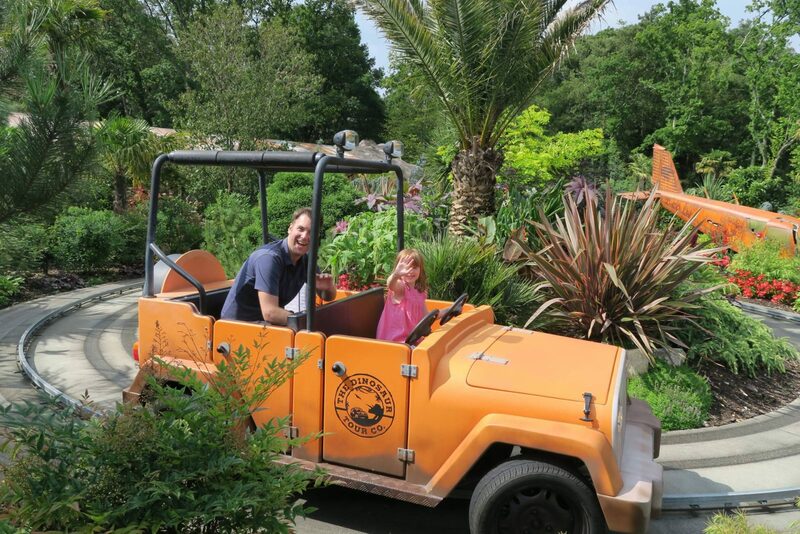 With Holly snoozing in the pushchair, Andy took Alice on The Dinosaur Tour Co. where you drive through the Lost Kingdom on a jurassic 4×4 expedition. I managed to find a bench where I could sit and wait for them to come past and Holly could carry on snoozing. While I was waiting opposite me was a dinosaur den and a dinosaur came out that you could queue up and have your photo taken with. Holly then woke up just as Andy and Alice went pass in their jeep. Then before I knew it Alice was running over to me so excited because she had her rangers licence. Andy wasn’t quite so excited as it cost him £9!! It was then time for an ice cream and there was plenty of places to buy one from. The girls then wanted to head back to Peppa Pig World and go on the Windy Castle ride. Before getting into the queue for Windy Castle we popped into Madame Gazelles school, which has a photo point opportunity inside. There are people there taking a professional photo which you can purchase, but you are also able to take your own. We then queued for Windy Castle, but it wasn’t long until it was our turn. You get a great view of the park when you are right at the top. Just next to Peppa Pig World tucked in the corner is a tractor ride and the queue wasn’t very long and we practically went straight on. It was another chance for the girls to drive us and Holly loves tractors! As we were back seat drivers, we took a quick selfie! 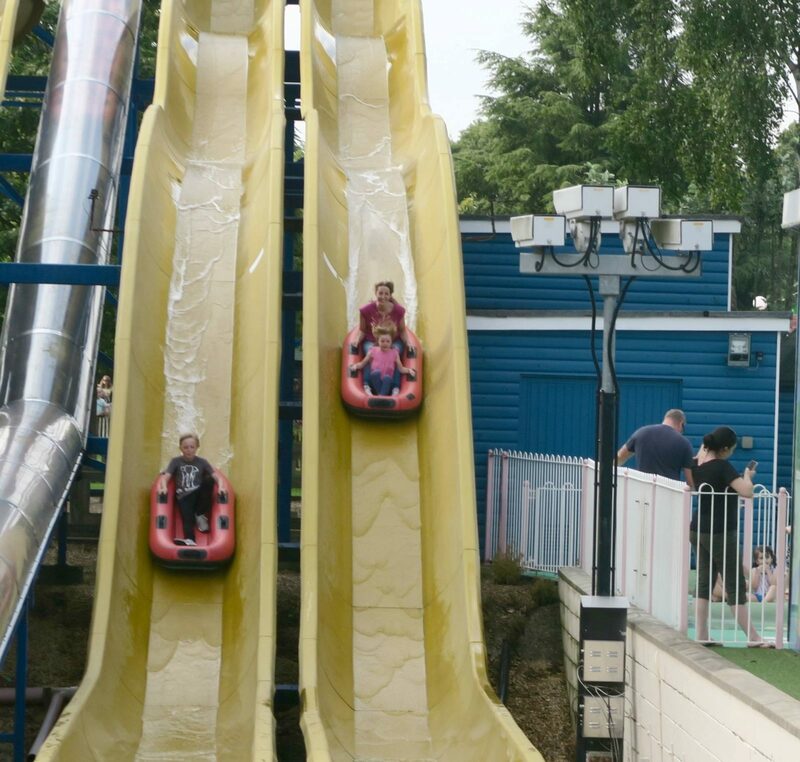 Just next to Peppa Pig World is a ride called the Wave Runner, which is large water slide where you sit in a rubber dinghy and descend down a steep trough on fast flowing water . We had pointed it out to Alice earlier in the day, but she wasn’t keen. But when we came off the tractor ride, Alice announced she wanted to go on the big slide and she choose mummy to go on with her, which I was secretly pleased about as I was really wanted to have a go! The queue was fairly long, but it moved really quickly and it wasn’t long until it was our go. Alice sat at the front of the rubber dinghy, with me behind and we were off. It was quite fast and we got a bit wet from the spray of the water, but not too much. Alice loved it and I was really proud of her for being so brave. 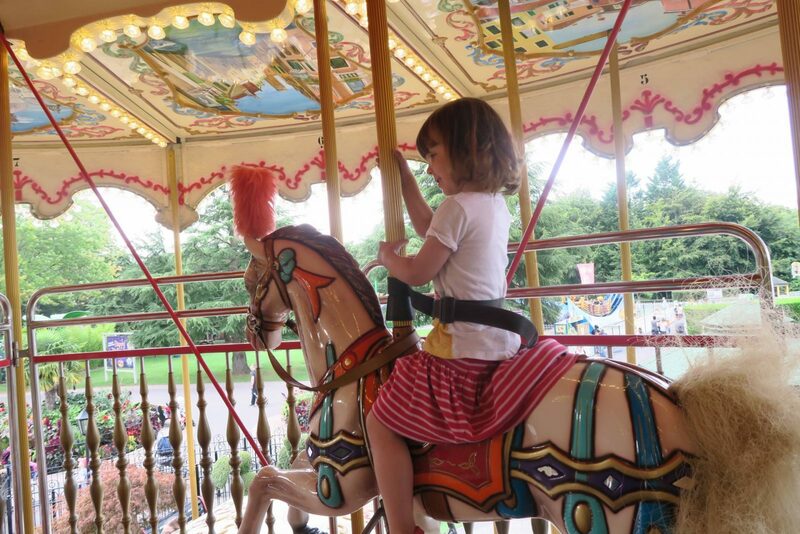 As the day was coming to an end, as we started to head out of the park the girls had a go on the merry go round. Alice was excited as it had an upstairs which we had never seen before. There was no queue and we went straight on. There was just enough time to squeeze in one more ride and we found a train ride that was perfect for them both. As the park was starting to close we headed to the exit and if you haven’t been before the exit means walking through the biggest gift shop!! There is a gift shop in Peppa Pig World which just does Peppa Pig items. But the main shop has Peppa Pig and lots more. We had an amazing day and made a little girls dream come true. 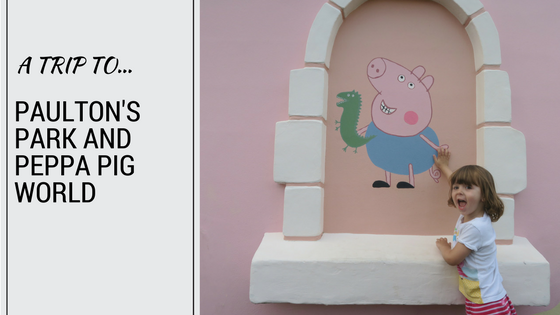 When we were in Peppa Pig World we were excited to see they are building some new rides that will be ready for Spring 2018. 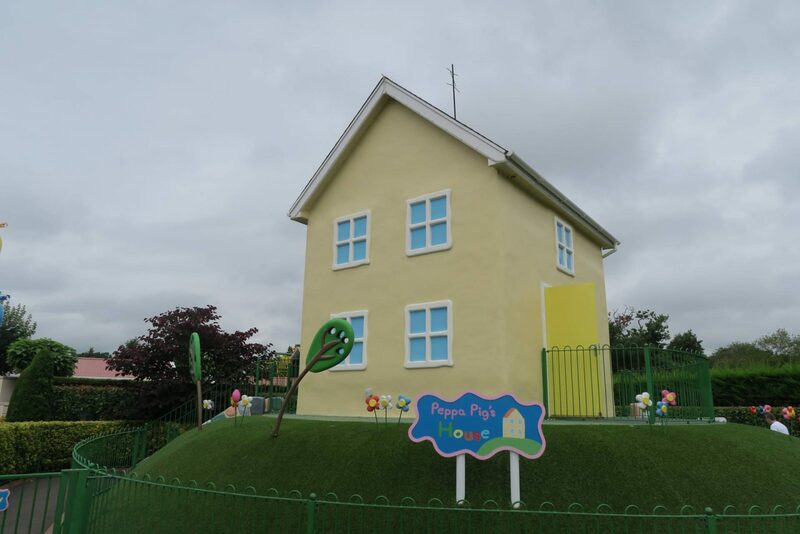 It’s not like we needed an excuse to return, but the Peppa Pig Castle they were building looked amazing! Disclosure: We are working with Hampshire Top Attractions and were invited to visit Paulton’s Park. All views and opinions are my own. It looks like you had an amazing day. 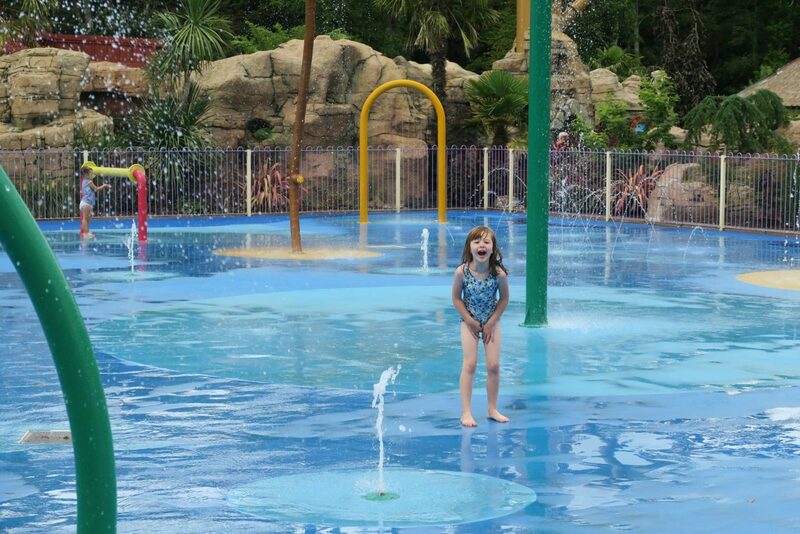 We went about 2 years ago and had so much fun but I do wish we could’ve used the splash park. Oh my goodness how brave was Alice for going down that slide. I would have been really scared and i’m in my thirties! It does look like a brilliant park and this is on my list of places to visit with the children. They are clever making you have to go through the shop for the park exit though. I do love a good gift shop though. This place looks like heaven – well not for me but definitely for my girls. Even though Meme is almost 7 Peppa Pig still can hold her attention. I will have to treat the girls to this amazing place. So glad I saw your post, I’m going next month and traveling from Yorkshire, and want to make sure we plan ahead and avoid queues where possible. I’m so excited my 18 month old loves Pepper Pig. Thanks for the tips. Ah we’ve been saying for a while that we must visit! My elder daughter is obsessed and this makes me all the more determined to take her soon. It will be a road trip but looks totally worth it. Sounds like you had a fab time. This looks like an amazing day out. Definitely somewhere I want to take my girls when they are old enough. My eldest still loves Peppa pig (she’s 4). I wish we lived nearer, she would love this place. The splash park looks great. Ahhh what a fab day out!! We keep meaning to go here when we are down that way but never get round to it. It looks great and the girls seem to have had the best time! Queueing is always the worst part of any day out like that, especially with kids, but 30 minutes isn’t that bad compared to some theme parks. We’ve queued for 90 minutes before now!! !